Do It Yourself Special: FREE plans to add MIDI capability to the Roland SH-09 with the Synhouse Original MIDIJACK! 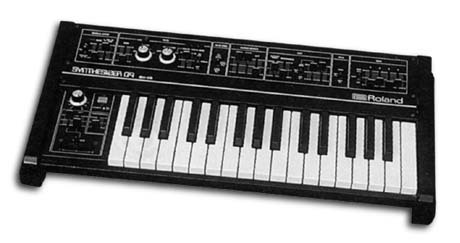 The following plans describe a method of adding MIDI capability to the Roland SH-09 analog synthesizer with the Synhouse Original MIDIJACK. The SH-09 is especially well suited for this modification due to the tiny size of the MIDIJACK circuit board. You may be able to do this yourself if you have experience with electronic repair and the soldering of wires and circuit boards. If not, you can ship the unit to Synhouse L.A. for a quick, low cost Factory Installation. For self-installation, it is best to print these notes out on paper to look at while working on the instrument and make notes and check off the steps as you go. As with any project, it is best to completely read and understand each step of the instructions before starting. The particular installation on which this document is based was on Roland SH-09 serial #044691, other revisions may be different. 1) Be sure to have the correct tools and supplies for for the job. If you do not have them, get them. You will need a regular size Phillips screwdriver, a smaller size Phillips screwdriver, needlenose pliers, strong wire cutters or other flush cut nippers, a hobby knife such as an X-Acto, scissors, a soldering iron, solder, and electrical insulating tape. 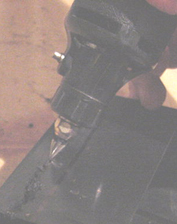 A Dremel Moto-Tool or hot knife will be useful if you wish to carve out the inner portion of the left side plastic end cap to accommodate the MIDIJACK board, as shown in this example by Synhouse. If you intend to mount the DIN jack on the back panel with the rest of the jacks, you will need to use a chassis punch (a small hand tool that safely cuts a clean hole in a metal panel) or step drill (a cone-shaped drill bit with many steps on it from small to large) to make the hole for the DIN jack, and an electric drill with a 1/8" or similar size drill bit to drill holes for the 4-40 hardware used to mount the DIN jack, and also a 1/4" or 5/16" drill bit to make a pilot hole to start the chassis punch. The correct size for mounting a MIDI DIN jack is 14.5 mm metric or 5/8" SAE (.62"/15.9 mm) in American sizes. A chassis punch may be purchased from any good tool or hardware store. 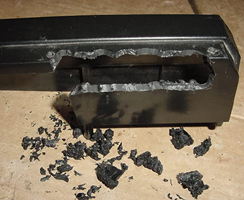 If it is more convenient, a punch may be mail ordered via internet or telephone from Mouser Electronics at http://www.mouser.com or (800) 346-6873. The Mouser part number is 586-3803 for the name-brand Greenlee 730-5/8 (about $30). The cheaper house brand part number is 380-0145 (less than $20). You will also need an 11 mm wrench (for Greenlee) or 1/2" wrench (for the Mouser house brand punch) or adjustable wrench to turn the chassis punch while cutting the hole. An automatic center punch would also be useful. This is an inexpensive spring-loaded pointed punch that can mark your drilling spot without the use of a hammer. Marking the holes with this small indentation will allow you to drill cleanly without slipping and scratching the synthesizer or drilling through your knee. The board and DIN jack can be mounted in the metal as shown in this example done by Synhouse, which requires a drill and a chassis punch, or the entire assembly can be done in the plastic end caps using only a hobby knife, with no drill or chassis punch required. 2) Fully test the Roland SH-09 to be converted to MIDI. Be sure that all functions such as VCF envelope work and that the instrument plays in tune while playing along with a known well-tuned instrument such as a newer digital synthesizer or sampler keyboard. If it doesn't work properly without MIDI, it certainly won't work with it. 3) The installation of the MIDIJACK in a Roland SH-09 is fairly simple, as long as you follow these instructions closely. All of the electronic work can be done on two boards without removing them. 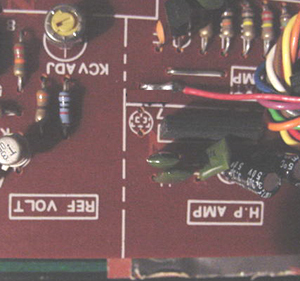 The Roland SH-09 has jacks soldered directly into the PC board and the safest way to access the signals without compromising the strength of the factory solder joints is to leave them just as they are and cut a tiny notch in the copper circuit trace a short distance away from the jack itself. This modification reroutes the local keyboard signals through the computer-controlled analog switching matrix of the MIDIJACK by extracting the signal and inserting the users' choice of local keyboard control or MIDI. 4) Extreme caution should be taken while working on the Roland SH-09. The unit should be unplugged while open and even then, the power supply may pose some electric shock hazard due to residual voltage in the power supply. 5) The entire synthesizer and interface jacks are mounted on three boards which are bolted like a PC board sandwich to the underside of the slider control panel. To make your life easier and do the installation quickly, completely remove this assembly as one unit. Remove the three Phillips screws on the lower edge of the rear side, and remove the three Phillips screws on each end of the control panel that are holding it onto the plastic end caps. They are on the bottom panel, two on the right edge, two on the left. 6) Open the case slightly and locate the green wire that serves as a ground strap, which ends in a terminal attached by a screw to the rear right corner of the base. Remove this screw to release the wire. Slightly separate the two halves of the instrument, which will still be connected by wires. Turn the synthesizer upside down and shake out any dust and debris that may have accumulated inside the instrument over the years. If required, the two plastic end caps may be removed by removing three Phillips screws on each end of the underside of the base, and note that each one has an extra screw to be removed approximately one inch in from the others. Remove anything else that may be holding the end caps in place. This should be done with extreme caution, as the the end caps are very fragile and possibly already broken. 7) Before unplugging any wires, look at them very carefully, and note their positions before removing any of them. There is a power supply in the base of the instrument that provides ground via two bundles of black wires and supplies a regulated +/-15 volts DC. There are two bundles of red wires that provide +15v, and two bundles of blue wires that provide -15v. BEWARE OF THE CONNECTOR POLARITY! 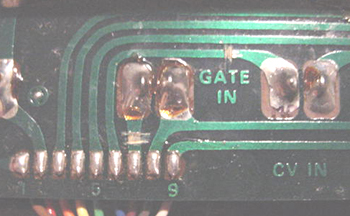 At first glance, it may appear that there are a series of identical 3-pin connectors that supply +/-15v to various modules of the synthesizer. This is NOT the case. Some are wired backwards, and reconnecting them the wrong way would certainly destroy some of the circuits. A good way to mark them is to use a marking pen such as a Sharpie to make a random slash mark or two or three across both halves of the connectors, a little differently on each, so that you can see if they are reconnected properly later on. 10) The upper panel/synth assembly should be free of the base now. 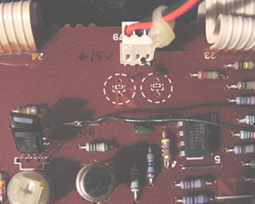 All electronic work can be done by connecting the MIDIJACK wires to the main board and jack board. 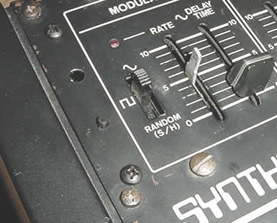 11) For this demonstration unit done by Synhouse, considerable effort was made to keep all MIDIJACK controls on the synth control panel, visible at all times, in a way that would look the most like something done at the factory. This meant putting the MIDIJACK board at the far left of the control panel, just to the left of the MODULATOR section, and the DIN jack on the rear panel, just to the right of the D in ROLAND. This required three special accommodations to be made. 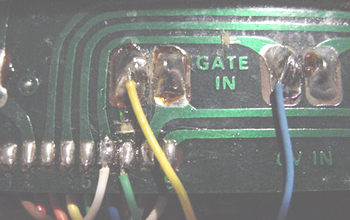 The left end cap of the SH-09 was hollowed out inside to allow space for the MIDIJACK board, and the rear of the board was insulated with electrical tape to prevent a short circuit against the metal frame right next to it. The main synth board was temporarily lifted an inch out of place to make room for the chassis punch and wrench while cutting the hole for the DIN jack. Do not connect anything to the -15v power, as it will damage the MIDIJACK. 17) Carefully examine all cuts and connections made to the jack board for mistakes or possible short circuits. Make sure that there are no foil pieces or solder bits left hanging around to cause a short circuit later on. The CV and gate terminals are now isolated and routed through the MIDIJACK. 18) The MIDIJACK #7 brown wire and #8 violet wire (unless it is used for a special function as described in the Advanced Installation Manual) are not required for adding MIDI to the Roland SH-09, but it is a good idea not to permanently cut these wires off, as an alternate installation method may become useful later. It is best to wrap the ends of these unused wires with heat shrink tubing or electrical insulating tape and bundle them with the other wires. 20) Carefully examine all connections and leads for possible short circuits before reassembling the chassis. 22) Test and calibrate using the procedures described in the Original MIDIJACK Installation Manual. This installation can be completed in as little as one hour, but extra time spent making a perfect installation is time well spent.